Invisalign braces are a wonderful option for those who have misalignments in their teeth. As opposed to traditional metal braces, Invisalign braces are essentially invisible. They can fix gaps, crowding issues, crooked teeth and more. With that being said, not everyone is eligible for Invisalign braces. If you think that these braces could be something you’re interested in, ask yourself the following questions first to make sure that you’re eligible. Invisalign braces work perfectly for older individuals, but children may not be eligible. This is largely because it takes a lot of responsibility to make sure that you keep your Invisalign braces in for the necessary amount of time. Most all types of braces are not exceptionally comfortable, and because these particular braces can be taken out and put in at will, young teenagers and children may not keep them in when they are supposed to, which won’t allow the braces to do their job. How severe is what you want to fix? 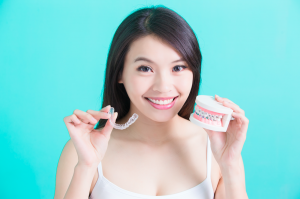 These braces can treat numerous problems in teeth alignment, including cross bites, overbites, under bites, crowded teeth, and gapped teeth. But if your situation is too severe, they may not be able to fix it. As an example, Invisalign braces are not meant to work with severe misalignments that require jaw shifting. To know whether or not these braces will work for your current situation, you’ll need to speak with your dentist or orthodontist. If Invisalign braces aren’t right for you, you can still work with traditional braces to fix your misalignment. Are you prepared to be responsible about wearing your Invisalign braces? Wearing these braces is fairly easy, and they’re extremely nice because they are hardly noticeable at all — unlike traditional metal braces. Most of the time, no one will know that you have them in in the first place. On the other hand, just like traditional braces, these braces can be rather uncomfortable. Still, it is absolutely essential that you wear your aligners for the recommended duration of time throughout the day. For most people, this means keeping the braces in your mouth for at least 22 hours each day. You’re supposed to take your aligners out when you eat and drink, but other than that and a few other exceptions, you need to keep them in. If you’re not prepared to be absolutely responsible in this regard, Invisalign braces may not be right for you. If you are interested in Invisalign and feel that you are eligible, the offices of Dr. Alla Agamov, DMD General & Cosmetic Dentistry can help. We offer Invisalign as a wonderful alternative to traditional metal braces. To learn more about this service and more others that we offer, give us a call at (781) 619-3211.